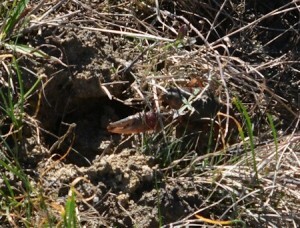 orange-red legs, one red claw easily visible. Up by the street (higher ground) two trenches were left years ago by someone with a backhoe. Over the years they've filled in partly, and fill with rain if there's enough. One has crayfish in it; the other doesn't. The bottom of the one that doesn't is covered with a layer of bur oak leaves. 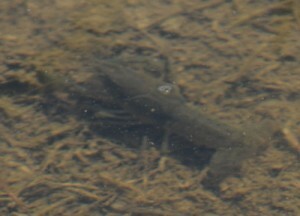 Clear shallow pool in meadow, has several crayfish (from very small to ~4 inches in it. Appear to be grayish, not green & red. 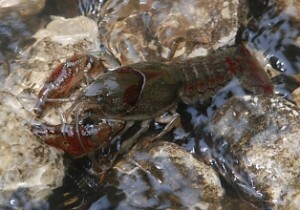 Large crayfish working its way upstream over rocks in stream crossing. When we bought this place, the only crayfishe were in the main creek and "overflow" channel near it. 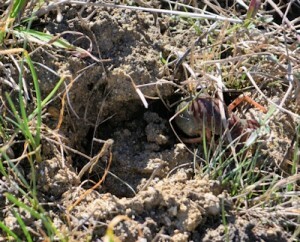 Water management practices have increased the number of places water stands or moves slowly in amounts large enough to attract crayfish, and in soil deep enough they can burrow and protect themselves in dry periods. 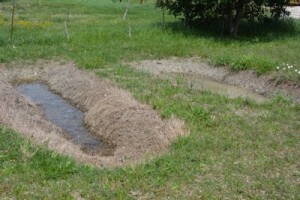 We are very glad to have them, as they are one biological measure of water quality. 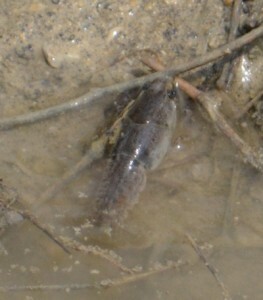 If you have a lot of them in a shrinking area of water (a static pool after rain) they make the water murky with their digging and moving around. 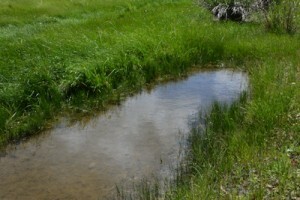 They didn't survive on our land--they moved back up the seasonal watercourse when it returned after the drought broke. They can handle 6 months of dry weather topside, in deep burrows where the air stays moist enough, but they can't handle 5 years. I only see them here when the river is receding from a big flood. 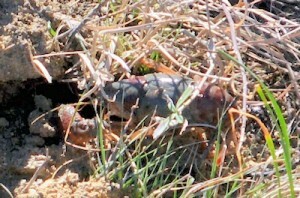 I know they are there the rest of the time, but they are very good at staying out of sight.